The perfect solution for The Perfect Game. The last thing Ray R. wants, is to miss anything to do with major league baseball. Ray is a retired school teacher from Waterford Michigan. He’s been using PC’s for that last 10 years and in addition to email and the occasional online game, Ray is an avid sports fan. He uses MLBTV to access all the Major League Baseball games from his 2 year old Dell laptop. Ray first heard of PC Pitstop through his neighbors because he lost Internet access and had a visit from Comcast. He knew he was following safe surfing practices, but wanted to insure there would be no more connection problems. 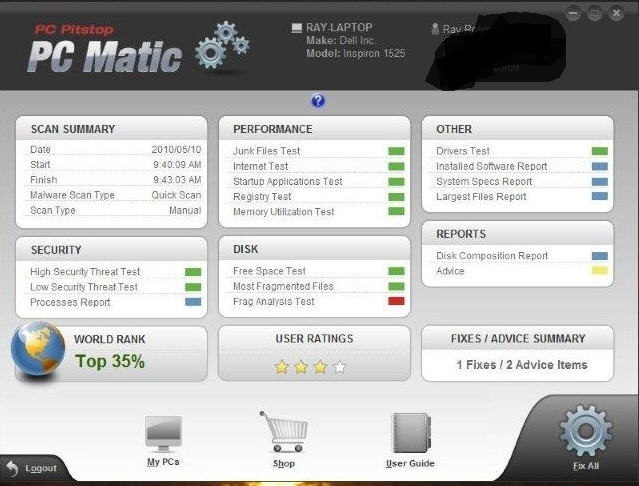 At the agreed time, we joined up through GoToMeeting and ran the first PC Matic Scan. Right of the bat my eyes go the red flag showing for the Driver Section. 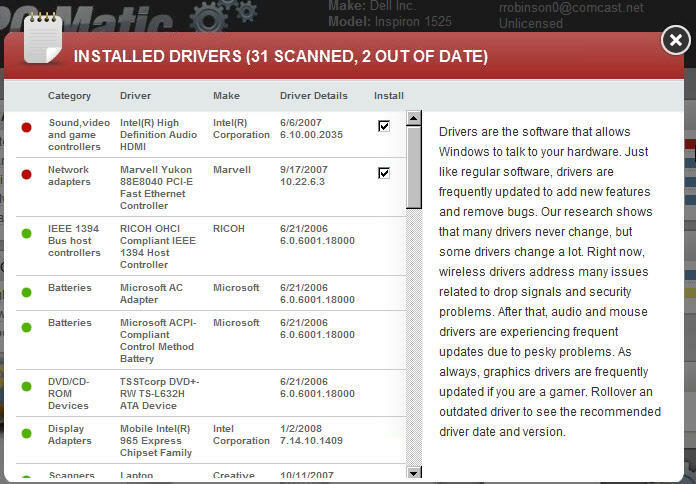 I’m hoping that PC Matic is suggesting a driver update for his network adapter and sure enough, there it is. Both sound and network drivers are suggested. Ray wasn’t experiencing any sound issues but Internet access was important and a recent problem. I take a quick look at the rest of the flags and suggestions and they all look pretty standard. The normal cookies showing in low level threats, junk files, Internet tweaks, disk fragmentation. There’s a total of 20 fixes but this is normal, even for a system that appears to be running well. I take a couple of quick screen shots for the writeup and click the “FixAll” button. PC Matic starts making the suggested fixes and it’s not long before it’s done. The whole process takes a little more than 3 minutes. 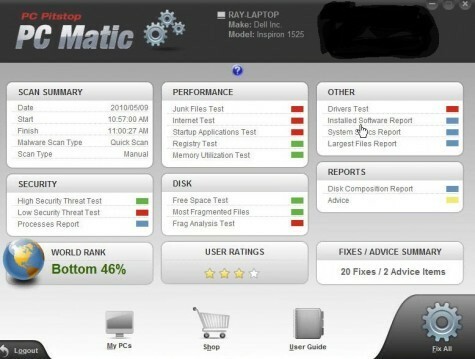 Ray ran PC Matic again the next day and sent the following screen shot this morning. Not bad! The drivers are installed and all flags gone with the exception of fragmentation. The “Advise Items” notification suggests that the red flag is due to fragmentation of excess System Restore points. If I choose I can remove these by turning off System Restore, running PC Matic, and then turning on System Restore and creating a new restore point. This is something that is not even checked with other defragmentation programs. If I choose not to do that, then fragmentation will be removed a little at a time with each run of the program. This reduces your wait time as the time needed to reduce the fragmentation of these large system restore files can be excessive. Extreme PC Makeover access, disk fragmentation, fragmentation, game, internet tweaks, major league baseball, PC Pitstop, Restore, screen, waterford michigan. permalink. Sounds like a good program. What is the chance I can experience the benefits of it???? ?